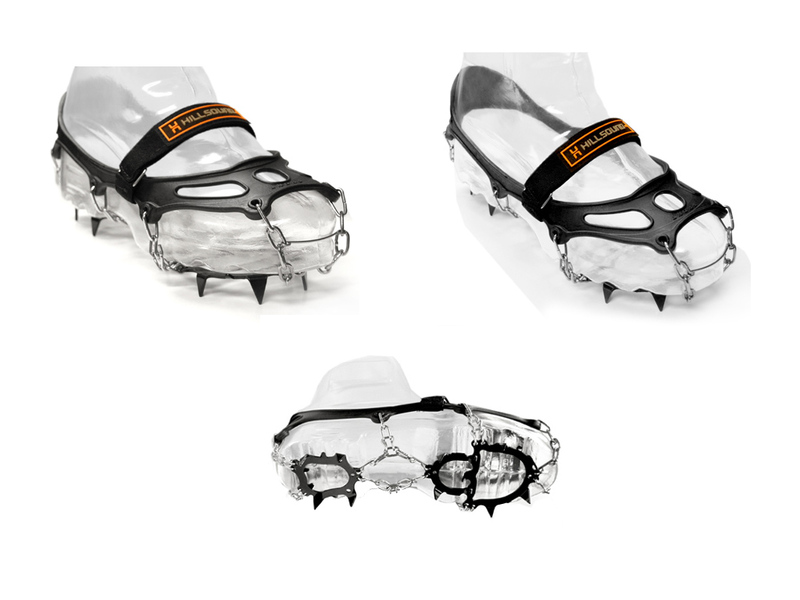 The design of the Hillsound Trail Crampons appear very well thought out. I like how the small spikes (0.7 in. / 18 mm) are separated into a contained front and rear section similar to mountaineering crampons. This is a very different design then MICROspikes® by Kahtoola, where the spikes are arranged into five sections. 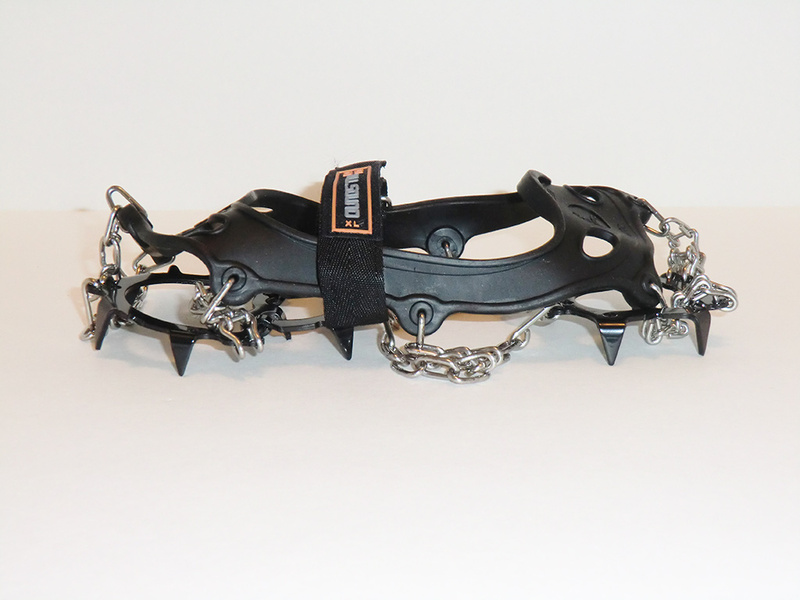 The spikes are also almost twice as long on the Hillsound Trail Crampons when compated to the Kahtoola MICROspikes®. This should mean increased traction with the Trail Crampons. 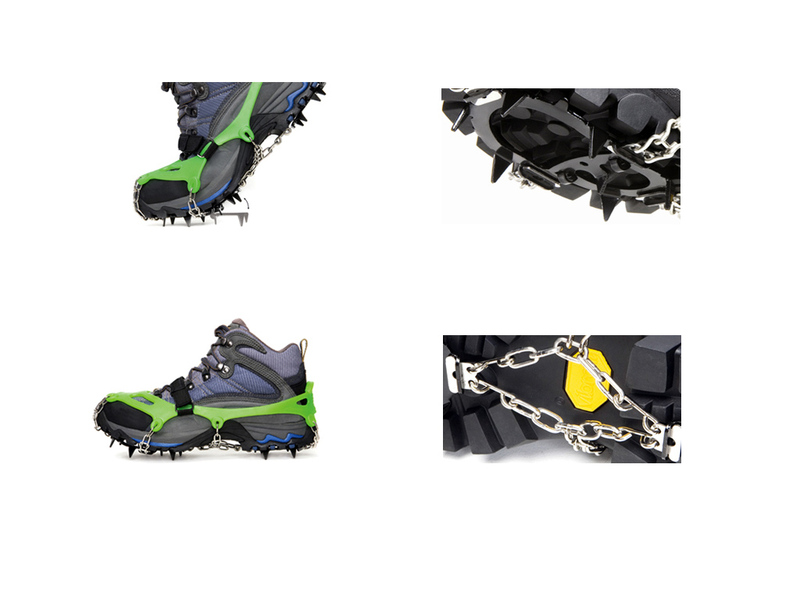 The Hillsound Trail Crampons have 7 spikes on the front section and 4 spikes on the rear section for a total of 11 (compared to 12 on Kahtoola MICROspikes®). The front section has a flexible hinge which is designed to provide increased traction on varried terrain. Hillsound Trail Crampons can be worn on either foot. I found them very easy to put on my size 11 Sorel Conquest winter boots. The front section goes over the toe of your shoe or boot and then you pull the rear section up and around the heel of your shoe or boot. The hook-and-loop closure strap over the top secures the Trail Crampons in place to prevent them from falling off. The fit looks great on my boots and feels very secure. While they are not designed for mountain climbing, they should have no problem on any winter trail. I think they are most suited for icy or hard packed snow. While they should provide traction in slushy wet snow, they will likely have issues with snow balling up underfoot (common with all crampons of this type). The advertised weight of the Hillsound Trail Crampons is 2 ounces heavier than Kahtoola MICROspikes® but my size XL weighed in at 16.1 ounces (only 0.5 ounces heavier than MICROspikes®). At just over a pound these will be easy to throw into my pack on all my winter adventures. The only thing I would like to have seen included is a storage pouch. I finally had the chance to test out my Hillsound Trail Crampons on a recent Spring hiking adventure with my wife Katie. It was a day hike in the Jefferson Wilderness where we encountered consolidated snow shortly after beginning our hike. The trail crampons were light, compact, and easily stowed in our packs. After slipping around in snow patches for half a mile, we both decided to put on our mini crampons. They were easy to put on for both of us. I was using lightweight mountaineering boots and Katie was using lightweight mid hiking boots. We immediately noticed the difference on both the softer- and icy snow. The Hillsound Trail Crampons gripped both surfaces very well, providing firm traction. They stayed firmly in place on our boots. Half way through our hike, we lost the snow for about half a mile so we had to remove the mini spikes. They were even easier to remove on the trail and strap to the outside of our packs until we needed them again. I found them very comfortable to wear on my stiff-soled boots. Katie found them to be a little tight on her softer, more flexible hiking boots, but still comfortable enough. We both appreciated the traction they afforded. As our adventure progressed the conditions became steeper. I ended up kicking steps into the steeper portions and was pleasantly surprised that the Hillsound mini spikes remained firmly in place. They really are not meant for that kind of abuse, but functioned well anyway. On the way back, there was one occasion while kicking steps into firmer snow that one of the mini spikes slipped part way off my boot. It didn't come off enough to cause traction issues and was easily slipped back into place on my boot. Honestly, I was surprised this didn't happen multiple times based on the conditions I subjected the Hillsound trail crampons to. My only issue with the mini spikes is I liked them so much, I became complacent and used them as though I had regular crampons on. This led to a couple minor falls that could have been avoided. When using the Hillsound Trail Crampons, always remember they are lightweight mini spikes meant for gentle terrain. They are not designed to climb mountains. They excel on Spring hikes when snow is often still present on trails. See Grizzly Peak, adventure where the Hillsound Trail Crampons were used. 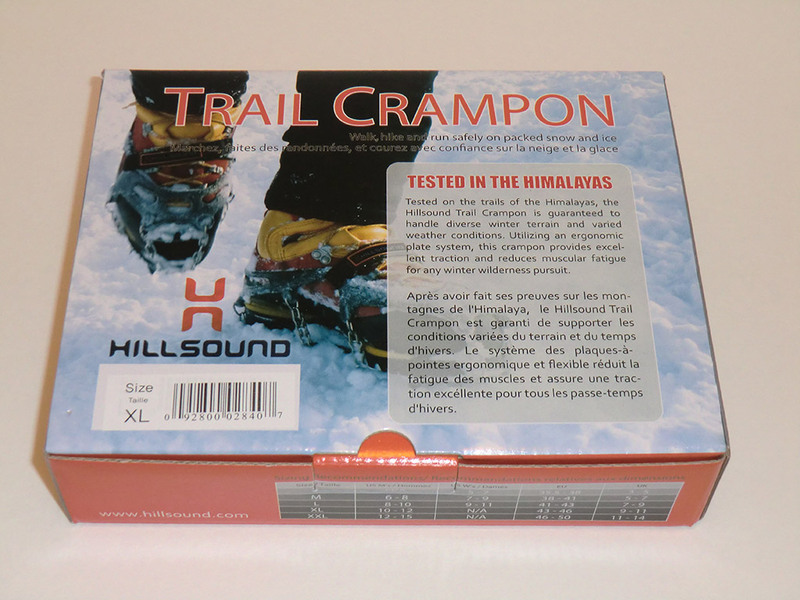 Special thanks to Hilsound for providing the Trail Crampons for review. Have you had further experience of the Hillsound trail crampons and have you used Kahtoola microspikes and if so which would you choose . I like both the Hillsound Trail Crampons and the Kahtoola MICROspikes, but I tend to prefer the MICROspikes because of the beefier rubber they use that does not require an extra strap to secure them on your foot.